There’s one name that consistently comes up in the legal cannabis community and with very good reason. Blue Dream has been the #1 seller in Colorado, California, and Washington for years according to BDS analytics, and continues to be the most reviewed strain on Leafly.com to this day. Some attribute this to the strain’s ubiquity, others to strong marketing. There could be many reasons for its popularity but there’s no debate to its quality-Blue Dream is fantastic, and Thrive Cannabis Marketplace is the place to buy it! Blue Dream is a sativa-dominant hybrid created by crossing breeding Blueberry and Haze strains. It inherits the mind energizing traits of the Haze sativa with the full-body sedation from Blueberry’s indica heritage. The result is a THC heavy nugget that’s a perfect smoke for creative types or working people looking to alleviate pain while increasing production. The buds are dense and heavily peppered with sugary trichomes. They tend to be light green with long, peach-colored pistils that carry an aroma redolent of mixed berries and sweet sandalwood. The flavor and aroma of Blue Dream smoke is unique and easily recognizable. The scent is best described as sweet and sugary with the slightest hint of cheese. The smoke is very smooth and tastes of musty berries. When Blue Dream is smoked, the amazing effects are felt almost instantly. 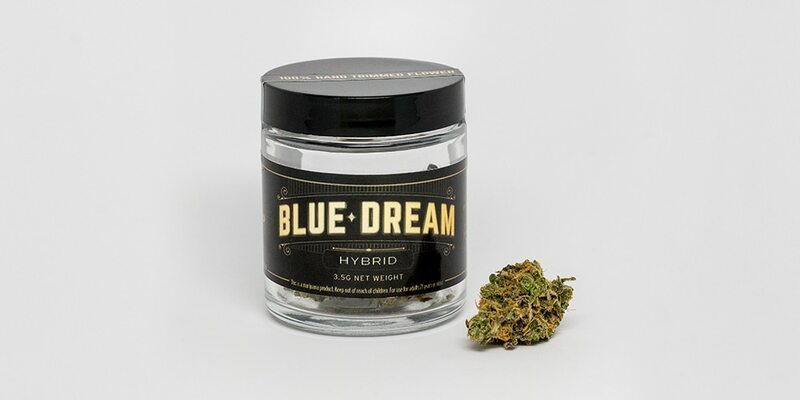 Many Blue Dream reviews describe the mental alertness as similar to a cup of coffee, with strong motivation and creative energy noticeable in most users. Many describe getting lost in tasks including cleaning, organizing, and workplace activities all while experiencing a body buzz that dulls even chronic aches and pains. The energy isn’t manic, though, as most users describe the prevalence of a calm euphoria while using this strain. DOES BLUE DREAM HAVE MEDICAL APPLICATIONS? Yes!!! Blue Dream effects are both body-heavy and energizing to the mind, making it ideal for daytime medication of pain, depression, and PTSD. Users have also reported excellent results for menstrual cramping and relief of physical and emotional symptoms of menopause. Those who suffer from anxiety disorders may find Blue Dream to be a good fit, as the mind is energized and alert, but not paranoid or “racy” as a pure sativa would be. Of course, it’s always best for those with anxiety to start with a small hit and be cautious not to take too much to avoid panic. Thrive Cannabis Marketplace carries the best phenotype of Blue Dream in Las Vegas, and at a fair price of only $11 a gram. Visit one of our dispensaries in North Las Vegas or Downtown, and start living the Dream today!